A gratin is a dish that’s typically loaded with cheese (and butter or cream) and heaps of crispy breadcrumbs. Thankfully, with a bit of creativity, we turned traditional rice and broccoli gratin into a delicious, “cheesy” casserole that is both dairy and gluten-free. The cheesy component in this recipe comes courtesy of nutritional yeast, which is the holy grail for vegan cheese lovers. It has a nutty and cheesy flavor which makes it a wonderful dairy-free cheese substitute. And it’s bright yellow flakes are chock-full of good stuff, like B-complex vitamins (including B12). 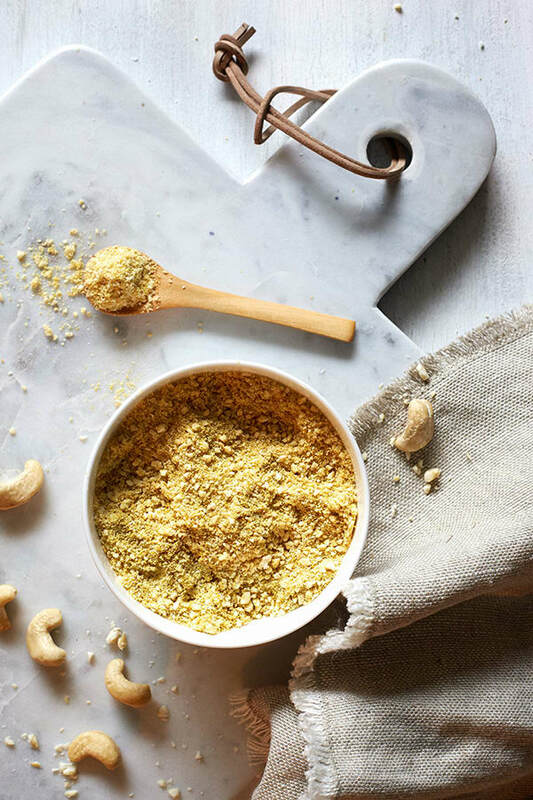 We blended it with cashews to give our “cheese” more creaminess and texture. The end result is a delicious, vegan-friendly cheese that can be sprinkled on any dish you like! 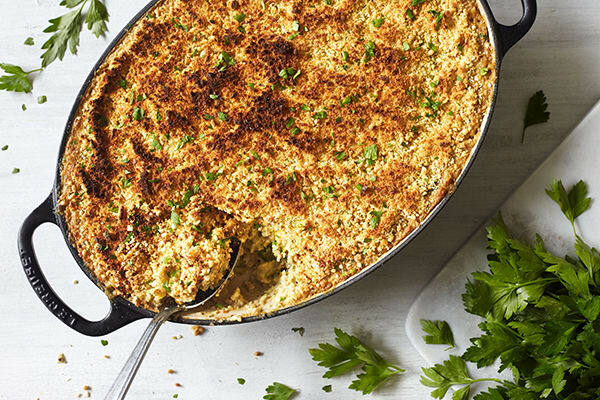 Instead of standard white rice, we swapped in cauliflower rice, a less carby alternative, that helps to pack even more veggies into this broccoli gratin. You can make cauliflower rice by processing or finely chopping cauliflower florets, or buy it pre-chopped in most grocery stores. Cauliflower is a magical vegetable that never ceases to amaze me. Besides rice, this humble vegetable can transform itself into almost anything. Nachos, pizza, pasta casserole… you name it: Cauliflower’s done it. In this dish, it also stands in for breadcrumbs. This recipe makes eight substantial servings, so it’s great for dinner parties or potlucks. If you won’t need so much food all at once, you can halve the recipe or divide the mixture between two smaller baking dishes. That way, you could bake one dish to eat right away, and freeze the other for another day (thaw it overnight in the fridge before baking). If you’re looking for even more delicious sides, check out FIXATE from 21 Day Fix-creator Autumn Calabrese and her brother, chef Bobby Calabrese. The two have put together an incredible menu of Fix-approved Thanksgiving recipes that are healthy versions of your favorites. From Green Bean Casserole and Cranberry Sauce to stuffing and Pumpkin Whoopie Pies, they’ve got you covered. Lightly coat a 13 x 9-inch baking dish with spray. Set aside. To make vegan cheese, place cashews, 3 Tbsp. nutritional yeast, ¼ tsp. salt, and garlic powder in food processor; pulse until mixture forms a fine meal. Set aside. Heat 1 Tbsp. oil in medium nonstick skillet over medium-high heat. Add arrowroot; cook, whisking frequently, for 1 minute. Slowly add almond milk; cook, whisking frequently, for 2 minutes, or until well blended. Sauce may be a little lumpy. Place almond milk mixture, remaining ¼ cup nutritional yeast, ½ cup vegan cheese, ¼ tsp. salt, and ¼ tsp. pepper in blender, in small batches; cover with lid and a kitchen towel. Blend until smooth. Return almond milk mixture to same skillet; cook, over medium-low heat, stirring frequently, for 2 to 3 minutes, or until sauce thickens. Remove from heat if sauce gets too thick. Set aside. Add cauliflower and broccoli; cook, stirring frequently, for 2 to 3 minutes. Combine cauliflower mixture, ¼ cup vegan cheese, remaining ¼ tsp. salt, and remaining ¼ tsp. pepper in a large bowl; mix well. Add almond milk mixture; mix well. Place in prepared baking dish. Bake, covered with foil, for 20 to 25 minutes, or until bubbly. Cauliflower rice may be found at your favorite grocery store. If sauce seems too thick after cooking, add 1 Tbsp. unsweetened almond milk; mix well. Keep adding almond milk until sauce is the right consistency.